Percy Woodhouse’s birth was registered in the fourth quarter of 1896, in Bedford. In 1901 the family were living in Park Hill Road Smethwick. His father Henry was recorded as a brass founder and had been born in Handsworth, Staffs. Percy’s mother Jane had been born in Birmingham. In 1911 Percy lived with his widowed father Henry, a brass moulder in motor manufacture, and his two brothers at 176 Cambridge Street. Percy was a chemist errand boy. Percy Woodhouse – photo by permission of Rugby Library. 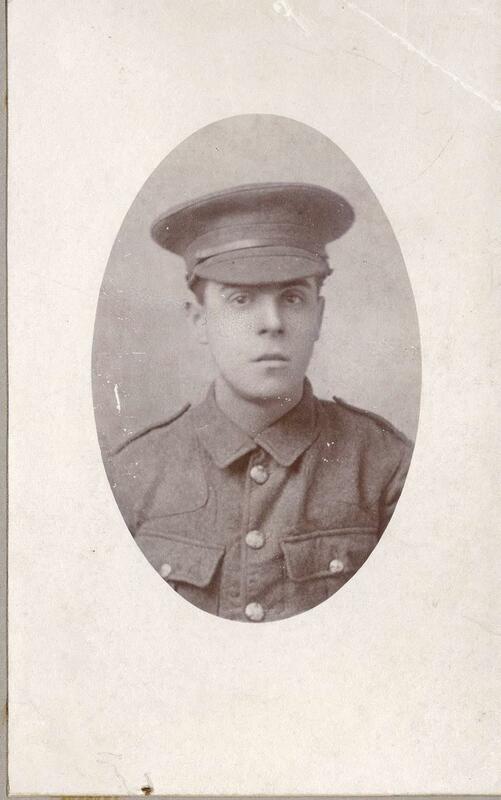 Percy Woodhouse enlisted with the 2nd Battalion of the Ox and Bucks Light Infantry and his regimental number was 11090. The 2nd Battalion had been stationed in Aldershot from 4 August 1914 as part of the 5th Brigade of the 2nd Division. On 14 August they had been mobilised and landed at Boulogne. The various actions the Battalion had been engaged in were in 1914 The Battle of Mons and the subsequent retreat, The Battle of the Marne, The Battle of the Aisne, and the first Battle of Ypres. In the Winter Operations 1914-15, they were engaged in the Battle of Festubert and the Battle of Loos. Percy Woodhouse was killed in action on 25 September 1915 – at the Battle of Loos. At the time of Percy’s death, his father Henry was living at 36 Acacia Grove, Rugby. Private Woodhouse 11091 and Private J L Turner 11090 who must, from their regimental numbers, have joined up together, and probably died together, are both remembered on Panel 83 to 85 of the Loos Memorial. However the Rugby Advertiser did not report Percy Woodhouse’s death until the 14 October 1916 edition. Percy Woodhouse is remembered on the Rugby Memorial Gate. This entry was posted in Biography and tagged 1915, Battle of Loos, Oxfordshire and Buckinghamshire Light Infantry, Woodhouse by Christine. Bookmark the permalink.